associated with a history of recurrent headaches then onward referral to the appropriate specialist would be recommended. There are many treatment options. Firstly, manual therapy techniques such as headache SNAGs for example , could be used to help loosen stiff joints in the neck. This can then also be incorporated in to a great self release technique at home (see videos below). Secondly, muscle release techniques, of which there are many types including MET’s, contract relax PNF and bow stringing. 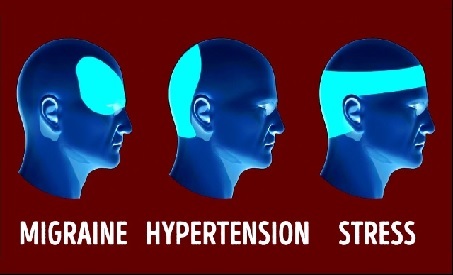 Tension headaches are often driven by referred pain from muscles. This can be in the form of “trigger points“. These are often the muscles that patients report having “knots” in. When pressure is applied to one of these painful muscle trigger points it will recreate the patient’s headache. This is good as it tells us we are in the right place, “x” marks the spot as they say! Travell and Simon’s have produced some very detailed work on trigger point referral patterns throughout the body. The image shows some of the referral patterns for the muscles in the neck. Through specific massage techniques or by using acupuncture symptoms will often alleviate within the first treatment session. This is not the golden cure, merely symptom relief. You need to try to understand why that muscle has got tense in the first place. It is often because a muscle has reached the point of fatigue and reacts in this way. This is common in particular with office based workers, spending several hours per day putting stress and strain on certain muscles of the neck due to poor posture. This leads on nicely in to the next way that Physiotherapy can help…exercise. Not general exercise (though this is important to consider in terms of whole body health and fitness) but specific exercises that can help to improve posture and the muscles that support the head on the neck. Not many people realise but the adult head is equivalent to a medium/large tenpin bowling ball in weight and it balances on the top of our spine. To help support it in place strong ligaments help attach the skull to the upper part of the neck but it is also very reliant on a group of muscles called the deep neck flexors to help hold the head in place. Poor posture was mentioned above in relation to office based workers in particular. This is becoming an increasing problem in the modern-day world with our use of laptops, ipads and mobile phones too. We know that muscles work in pairs. 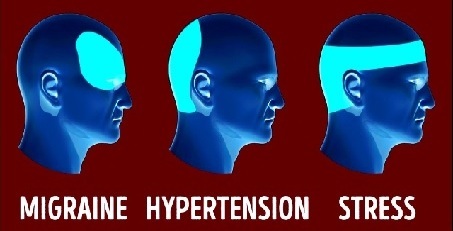 A common clinical finding is tension in the muscles that attach at the back of the skull to the neck with corresponding weakness in the muscles that support at the front of the skull to the neck. Therefore there has to be a good balance between these muscles and this is particularly important when sitting for long periods of time. Much has been written about “core stability” and in particular in relation to the lower back. Think of your deep neck flexor muscles as your core muscles for supporting your head on your neck. As a starting point the exercise below can often help alleviate tension headaches. If you have one and it does then you know these muscles are weak and they need further work. Apologies it’s not the most flattering of exercises but it is effective! The idea of this blog was to raise awareness of the types of headaches and what things you may be able to do to help. Next time you have a headache and you go to reach for the Nurofen , Anadin or any other well know brand of headache relief medication then think again. Could something else be more effective out there!